While for 99.44% of the population eight track tapes meant exclusively pre-recorded music, it WAS possible to record your own, with companies like Radio Shack selling home recording decks such as the one pictured in this 1971 Allied Radio Shack catalo. 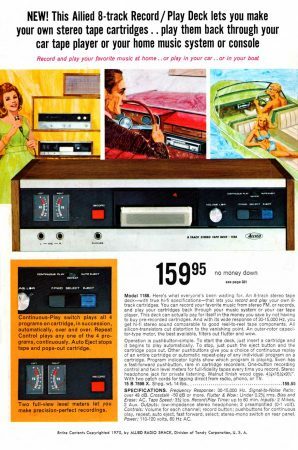 The woman warbling her own tunes into the eight track recorder is some artist's optimistic fantasy; I doubt her husband in the car in the next panel would want to listen to solo vocal performances. Besides, eight track recording was HARD to do precisely – once again because of that continuous loop, there was literally no way to rewind and start over. 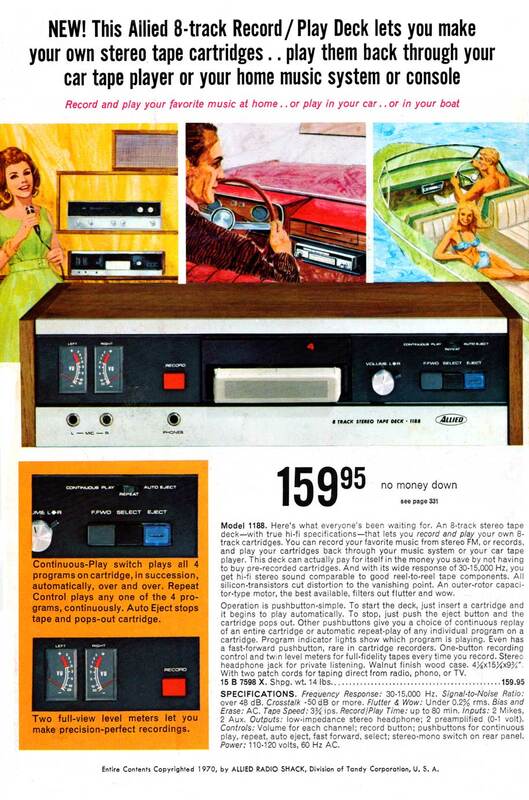 Still, audiophiles could transfer their records to eight track tapes and play them on the go. 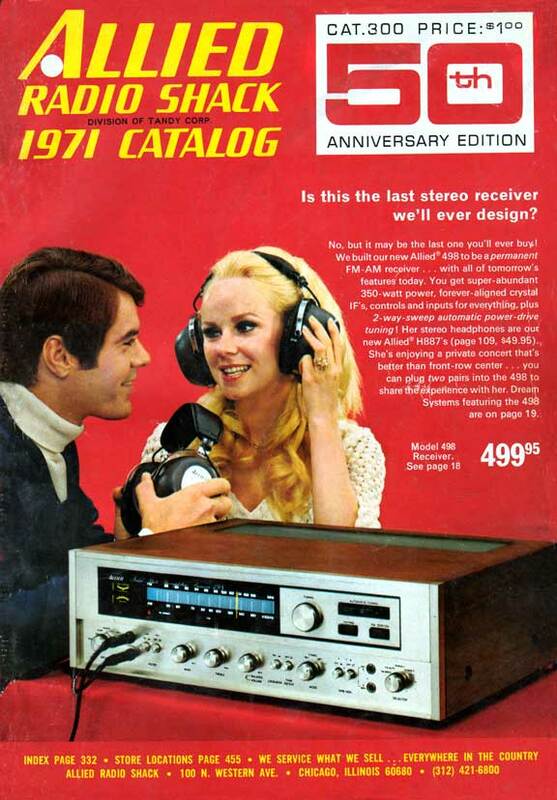 So Radio Shack continued selling blank recordable 8-track cartridges until 1990. In 1971, Radio Shack (originally of Boston and recently moved to Fort Worth Texas) had just merged with Allied Radio out of Chicago. They celebrated the combined companies with this gigantic 50th anniversary consumer catalog, at 456 pages perhaps the largest they every produced. This particular catalog was your Catalog Blog curator's personal electronics bible growing up. Close reading and re-reading of this catalog's sacred texts gave him his first big picture of what was important in hifi, stereo, electronic components, and test gear. The very next year Radio Shack dropped all the brand name consumer electronics that Allied had carried as well as the consumer mail order business in favor of Radio Shack-branded products and more and more Radio Shack stores. In the late 1970s, Allied Electronics regained it's independence. Radio Shack has now gone bust, but funny enough, Allied Electronics is still with us and celebrating 90 years of electronic component sales this year. Next Next post: Depression? What Depression?